Let the olive oil flow like wine. It’s time to eat some Greek cuisine! Of Mediterranean origin, Greek food has a fresh flavor and appearance that satisfies cravings for gyros, pita, and feta cheese. The chefs of ancient Greece outdid themselves as most of their staple recipes are still used in Greek restaurants today. Here are the 10 best Greek restaurants in Wisconsin. Order some meze, small plates of food meant to be shared with family and friends and served with wine and spirits, to start off dinner right at Plaka Taverna. Then continue with traditional Greek fare, and enjoy lamb kabobs or a moussaka dinner, complete with rice pilaf, green beans cooked in tomato, and feta cheese. Gyros, gyros, gyros. Good for breakfast, lunch, and dinner; it all depends on what you put inside of them. Try a cheddar-filled one for breakfast and order the Gyro Original platter for lunch or dinner, which includes olives, peppers, and feta cheese. Pallas has been established since 1989, and throughout all of the years the restaurant has stayed true to using fine ingredients for their homemade recipes. Pallas Restaurant has the whole shebang, including souvlaki and homemade original Greek yogurt available. If you’re looking for a combination of old school and new school, visit Pallas. 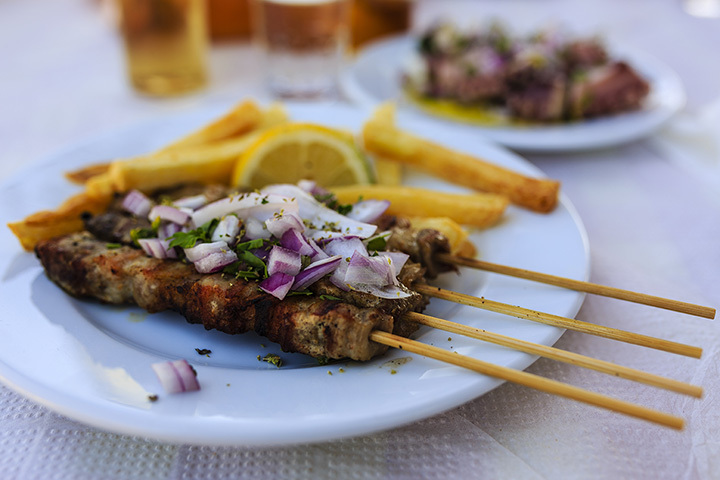 Not only does Dhimiters serve authentic Greek food at their brick-and-mortar restaurant, but you can also order their cuisine at the Dhimiters food truck. Check online to see the places where the food truck will be traveling to next. As for the menu, it has it all—from baklava to falafel. What’s unique about Omega Restaurant is that it’s open 24 hours. What’s also unique is the variety of flavors that Omega offers. Their dishes are accented and influenced by Greek, Italian, and Mexican cuisine. Be sure to try the Omega Greek Salad or the quarter-pound Polish sausage, either way you’re in for a treat. Freska invites you to “experience an innovative approach to fresh authentic Mediterranean food.” The core of the Freska menu lies in homemade pitas, roasted and grilled meats, and hummus along with veggies, beans, nuts, olives and of course—olive oil. After you enjoy your meal, remember Freska also caters for events. What’s better than Greek food? How about Greek food on-the-go? Athens Grill recently opened a drive-through window at their Waunakee restaurant. If you’re feeling really feisty try the char-grilled Gyro Burger, a single seared beef patty with gyro meat, feta cheese, onion, pickles, and tzatziki on sesame seed bun. Established in 1994, Apollon serves “Mediterranean Rim and Fine Hellenic Cuisine.” The original owner, Stavros Kodis, was born and raised in Greece; according to the website he taught and trained the entire staff his ways of cooking. The menu features classic Greek dishes like saganaki, tyropitakia, and spanakopitakia. Home of some of the best gyros, Gyro Kabobs has more than 10 different gyro options including different combinations and platters available. Complement your gyro order with something off the “Salads and Stuff” menu section. Try a Greek salad, a Gyro salad, or a falafel pita pocket. Stop into the Mediterranean Cafe for a quick bite, or order online and simplify your life. According to its Facebook page people talk about the “lamb plate,” the “excellent chicken shawarma,” and the “lamb and beef shwarma.” Recommended by 96 different folks, Mediterranean Cafe is sure to satisfy your Greek-food craving.